“With a recent Supreme Court ruling allowing nominees to run even if they do not belong to the marginalized and underrepresented sector that they claim to represent, it was only a matter of time for the partylist system to be overrun by the same political dynasties common in local politics,” the group said in a statement. It claimed that several partylist groups are “tied with powerful local and national politicians” while some have nominees from the same family. “More and more we see partylist nominations being passed on to or inherited by a member of the same family, no different from the practice of dynasties in other elective positions,” Kontradaya said. It argued that the current practice “goes against the spirit of the partylist system,” especially since the Commission on Elections (Comelec) does not have guidelines on the selection of nominees. “The Comelec does not even require partylist groups to provide proof of a democratic selection process of the nominees, where members of the partylist actually get to choose their nominees,” it said. Serbisyo sa Bayan Partylist (SBP) — SBP said to be associated with House Speaker Feliciano Belmonte since the first nominee is his nephew Ricardo Belmonte, Jr. If the younger Belmonte wins, Kontradaya said this would allow the Belmontes to have three seats in Congress. It pointed out that SBP is similar to the House leader’s initials “SB” or Speaker Belmonte. Association for the Development Dedicated to Agriculture and Fisheries Inc. (ADDA) — The first nominee of ADDA is Grace Kristine Singson Meehan, daughter of Ilocos Sur Rep. Eric Singson. AAMBIS-OWA (Ang Asosasyon Sang Manguguma Nga Bisaya-OWA Mangunguma, Inc.) — AAMBIS-OWA’s first nominee is incumbent congresswoman Sharon Garin from a political clan in Iloilo. She is the sister of Health Secretary and former Iloilo reprsentative Janette Garin. Kontradaya also said that its second nominee is Apolinario P. Arnaiz Jr., former Negros Oriental vice governor and brother of incumbent congressman George Arnaiz. Abono Partylist — The Abono partylist has long been linked to the Estrellas of Pangasinan and the Ortegas of La Union. Kontradaya claimed that its first nominee Conrado Estrella III has a net worth of P28.44 million while its second nominee is the wife of Abono’s three term representative Francisco Ortega III. 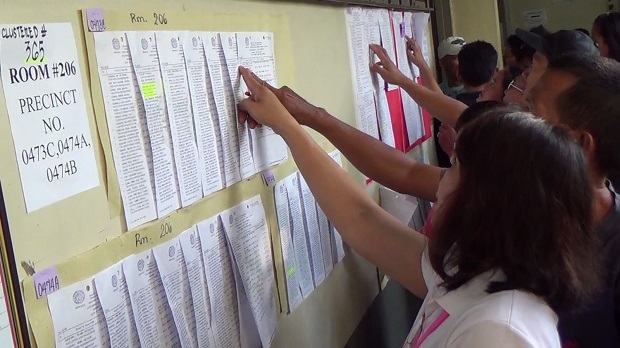 Kasangga Partylist — Their first nominee is Gabriella Calizzo-Quimpo who is a three-term vice governor of Aklan. Her husband is running to replace her as vice governor. Kasangga partylist’s second nominee, on the other hand, is former Transportation and Communication undersecretary Jose Perpetuo Lotilla while its fifth nominee, Jose Ciceron Lorenzo Haresco, is the son of incumbent congressman Teodorico Haresco. Before being elected as Aklan congressman, Haresco was a Kasangga representative. Ang Mata’y Alagaan (Mata) Partylist — The group has been linked to the Velasco clan of Marinduque. Its first nominee, Tricia Nicole Velasco-Catera, is the daughter of current Mata Representative Lorna Velasco and sister of incumbent Marinduque representative Lord Allan Jay Velasco. Their father is Supreme Court justice Presbiterio Belasco. Abante Mindanao (ABAMIN) — One of its nominees, Jocelyn Rodriguez, is the sister of Cagayan de Oro congressman Rufus Rodriguez and outgoing ABAMIN representative Maximo Rodriguez. Agbiag! Timpuyog Ilocano, Inc. (Agbiag) – Agbiag’s first nominee Michaelina Antonio is the wife of its current representative Patricio Antonio. #VotePH2016: The Inquirer multimedia coverage of the 2016 national and local elections in the Philippines provides to voters the latest news, photos, videos and infographics on the candidates and their platforms, as well as real-time election results come May 9, 2016. Visit our special Elections 2016 site here: http://www.inquirer.net/elections2016.